A panel of three federal judges in North Carolina ruled on Monday that the state’s congressional districts were unconstitutionally gerrymandered to favor Republicans. The ruling isn’t a surprise, as the court reached the same decision in January. The case has been watched closely for years, since it could have major implications for gerrymandering nationwide, but now, there’s a chance that it could impact the midterm elections. In the new ruling, the judges said North Carolina’s map, which was admittedly drawn to favor Republicans, is so egregious that they might require new districts before November. Both parties have been given an opportunity to present arguments on what should happen next, and it’s likely that the case will be appealed to the Supreme Court. But with the current 4–4 split between liberal and conservative justices, the lower court’s rulings may stand for now. Here’s what led to this messy predicament, and what it might mean for upcoming elections. North Carolina is a purple state, but thanks to its extreme gerrymandering, you wouldn’t know it from looking at its congressional delegation. Though Barack Obama narrowly won the state in 2008, and he and Hillary Clinton lost by less than four points in 2012 and 2016, Republicans have held ten of the state’s 13 House seats since 2012. When districts were redrawn after the 2010 census, Republican lawmakers packed more black voters into Districts 1 and 12. A federal district court struck down that map in February 2016, saying it violated the 14th Amendment’s Equal Protection Clause, as the redistricting was based solely on race. The state had to adopt a remedial map before the 2016 elections, and months later the Supreme Court affirmed the lower rulings in a 5–3 decision. In a brazen move, Republican legislators passed a plan that left the rejected districts essentially as they were. Their justification: They were trying to make a map that favored the GOP, and thus discriminating against all Democrats, not just black voters. Republican state representative Dave Lewis stated this very clearly during the redistricting process in 2016. “I propose that we draw the maps to give a partisan advantage to ten Republicans and three Democrats, because I do not believe it’s possible to draw a map with 11 Republicans and two Democrats,” he explained at a statehouse hearing. Lewis’s remarks may sound like the kind of thing you shouldn’t admit in public, but arguing that they were engaging in partisan, not racial gerrymandering, was the Republicans’ strategy. 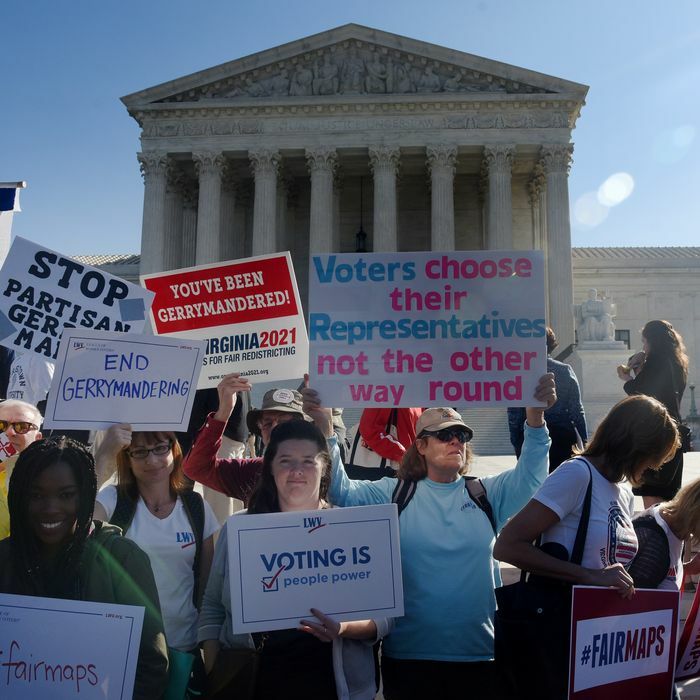 However, that plan backfired in January 2018 when, for the first time ever, a federal court ruled that partisan gerrymandering also violates the Equal Protection Clause. The court ordered that the map be redrawn, again, but at the time it seemed likely that the Supreme Court would stay the decision, keeping the disputed maps in place for 2018. As the maps below show, redistricting could have a significant impact, particularly in an election where Democrats only need to pick up 23 states to flip the House. The Supreme Court has never ruled on the question of whether partisan gerrymandering is constitutional, and in June 2018 it passed up two opportunities to take up the issue, sending cases from Maryland and Wisconsin back to lower courts. In the more significant Wisconsin case, the Court said the plaintiffs did not have standing to bring the case. In light of these two decisions, the Supreme Court declined to take up the North Carolina case, and sent it back to the three-judge panel of a federal district court in North Carolina for reconsideration. New districts before the midterms? While it appeared that SCOTUS’s reluctance to take up the issue would shelve the issue until after the midterms, on Monday the three federal judges in North Carolina said that the higher court’s rulings only reaffirmed their conclusion that partisan gerrymandering is unconstitutional. He proposed several unusual ideas: appointing a special master to draw new districts, holding general elections without party primaries or even turning the November elections into a primary and holding the general election sometime before the new Congress convenes in January. If changes are made this year, Mr. Cohen said, significant bureaucratic miracles will have to be performed to meet a deadline of Sept. 22 for mailing absentee ballots to voters in the military and overseas. Imagine it, Mr. Cohen said: New districts will have to be drawn. The courts — and perhaps the Supreme Court — will need time to rule on them. A filing period for candidates will have to open and close. The state will have to update its rolls to assign millions of voters to their new districts. And ballots will have to be printed. All before Sept. 22. “I’m very sympathetic to the plaintiffs here, but it would be insane,” Mr. Cohen said, to try to meet that timetable. It’s likely that Republican legislators will seek an emergency stay from the Supreme Court, which currently has an even number of justices, since Justice Anthony Kennedy has retired and hearings for his likely replacement, Brett Kavanaugh, won’t start until September 4. If the Supreme Court comes down 4–4 on the stay, the lower court’s ruling will stand. As the Times notes, the Court is currently split between “four conservatives who have expressed skepticism about the court’s ability to tinker with political maps, and four more liberal justices who have argued that it has that ability.” Chief Justice John Roberts is seen as the potential swing vote who could side with the Court’s liberals to end partisan gerrymanders — but that doesn’t seem very likely, since during the last term he expressed concerns about involving the Court in political matters. The lower court’s affirmation that partisan gerrymandering is unconstitutional increases the likelihood that the Supreme Court will finally take up the issue. Those in favor of gerrymandering reform believe the case may be their best opportunity to rein in partisan gerrymandering, since GOP legislators were so clear about their motives. Common Cause, one of the groups challenging the maps, called Monday’s decision a victory. But the prospects of the Supreme Court putting a stop to partisan gerrymandering after Kavanaugh’s confirmation are grim. In fact, the Court may even roll back state-level efforts to prevent partisan gerrymandering by taking redistricting power out of legislators’ hands. Kennedy sided with liberals when the Court upheld Arizona’s independent redistricting commission in 2015, and nothing in Kavanaugh’s record suggests he’s eager to advance voting rights protections.